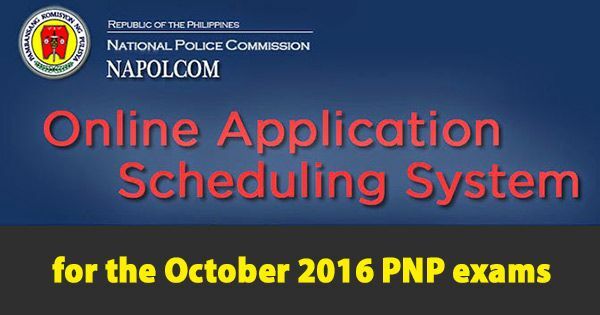 The National Police Commission (NAPOLCOM) announced the online application scheduling for the October 2016 PNP entrance and promotional exams. Bookmark and visit this site regularly for links. According to its website, the NAPOLCOM conducts two sets of police examinations: one for those who are already in the police service (promotional), and another for those aspiring to enter the Philippine National Police (PNP entrance). The PNP Entrance Examination is open to all Filipino citizens who meet the age, height and educational requirements while the Promotional Exams are open exclusively to all qualified uniformed members of the PNP who meet the minimum qualification standards for examination in terms of rank and eligibility, the announcement stated. The NAPOLCOM said applicants must utilize the online application scheduling system to request the Regional Office for their schedule in filing of examination application. Applicants are required to personally appear at the NAPOLCOM Regional Office on the date assigned to them, with their printed on-line confirmation letter and other required documents, for further evaluation, it added.